No Limits to Their Sway: Cartagena’s Privateers and the Masterless Caribbean in the Age of Revolutions by Edgardo Pérez Morales is one of the best and most interesting books I have read about Cartagena’s history. With a unique topic that focuses on the sailors that raided Spanish trade ships during Cartagena’s short lived independent state of 1811-1815, it sheds light on a little known but fascinating aspect of the city’s history. Read on for a complete review of No Limits to Their Sway. 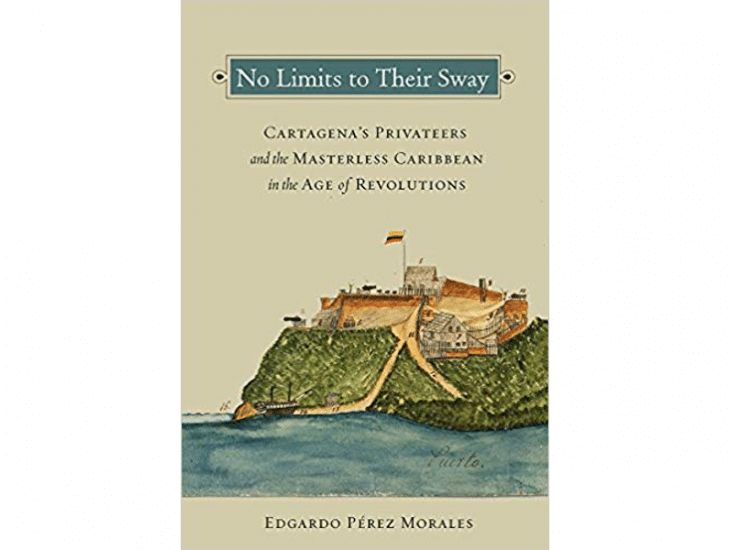 Edgardo Pérez Morales’s No Limits to Their Sway: Cartagena’s Privateers and the Masterless Caribbean in the Age of Revolutions is a unique and worthy contribution to the literature about Cartagena’s and the wider Caribbean’s history during the independence movements of the early 1800s. Morales’s study focuses on privateers hired by the Free State of Cartagena during its short lived existence as an independent state from 1811-1815. Privateers were privately owned ships that were given licenses to raid a country’s enemies at sea. In a sense, they were pirates with licenses. They were an accepted and important part of naval warfare from the 16th to the early 19th century. For a fledgling independent state like Cartagena, they were an important source of naval power as well as revenue. Often overlooked, Pérez’s study sheds light on their role and importance to Cartagena. Their overlooked status belies one of Pérez’s points, the use of privateers was in many ways a challenge to traditional power structures. Many of those traditional power structures were reinforced after the wars for independence, and the privateers were largely written out of history. Their use was such a challenge in part because many of them were free black men or runaway slaves, often from Haiti. Pérez therefore correctly points out that their use was in many ways symbolically connected to the revolutionary nature of Cartagena’s experiment in self-government, which granted racial equality before the law and even saw the participation of blacks such as mulatto artisan Pedro Romero in its government. Pérez’s examination of the international and cosmopolitan character, as well as the radical for its time racial equality of the Free State of Cartagena is particularly interesting. Therefore, the book overall is an interesting read that sheds light not only on the overlooked role of privateers, but also the agency of ex-slaves and the important but too often underestimated role of Haiti in the “Age of Revolution” in the Americas. Pérez’s book is an academic historical study. It is probably more aimed towards academic historians and university history students than the general public. However, the book is still very accessible and does not get bogged down in unnecessary academic jargon or theory. The subject matter itself is also immensely fascinating. Stories of sailors, buccaneers, and pirates tend to capture our imaginations and Pérez’s book, academic or not, succeeds in doing so. The chapter on the sailors’ lives at sea in particular provides some interesting and humorous episodes. Often considered little better than pirates, the privateers employed by Cartagena could be rough and colorful, but also clever and resourceful figures. Helpful as well is Pérez’s tracing of the story of one ship in particular, the Bellona, captained by a Frenchman. While the book is not a history of this ship alone, Pérez’s weaving of its story throughout his chapters helps give the book a more human and personal touch than a simple accounting of the history. The book also provides one of the best accounts I have read about the events of Cartagena’s Declaration of Independence and the sociopolitical forces that helped shaped them. Therefore, the book is a good read by anyone who is interested in learning more about Cartagena’s independence, the lives of sailors during the storied “Age of Sail,” or the forces, including race, that helped shape the independence movements of the Caribbean. I thoroughly enjoyed reading No Limits to Their Sway, and gobbled it up. I even read it on the beach. In full disclosure I probably should say I was a history major and am a bit of a nerd. Still, Pérez has written a fascinating book on a little studied issue that I not only found informative but also found capturing my imagination and not wanting to put down. Interested in learning more about Cartagena’s Independence and history? Check out my series of articles on the city’s struggle for independence, beginning with Why did Cartagena Declare Independence? Check out my articles on the history of Cartagena: A Primer on the History of Cartagena (shorter read) and A Comprehensive Guide to the History of Cartagena (a longer, more in depth read). Planning your own expedition to Cartagena? This entry was posted in Learn About Cartagena and tagged Cartagena Book Reviews. Bookmark the permalink.